Design, Creative & IT Businesses In Oban and North Argyll. Oban-based company offering web design and small business IT services including support and/or training on many common software programs. Small creative company based in Oban specialising in graphic design, corporate branding, database solutions and email marketing. Taynuilt business offers hardware and software support, virus & spyware removal, broadband & wireless, data backup and recovery, custom built systems etc. Printing, signage and web design company offering business stationary, logo design, bespoke artwork and more. Small website and design company specialising in CMS webasites and the creation of interpretation designs, trail guides, leafles etc for visitor attractions. Professional IT services for businesses and home users. System sales, repairs, upgrades, remote support, printer repairs, networks, CCTV and more. OCS offer computer repairs and techsupport, including broadband setup, wireless network installation, virus removal, software training and business support. Bespoke websites only invoiced once they are online and the client is happy. OWD work closely with clients so their website reflects what the company stands for. Pole Position provides a comprehensive range of internet services designed to maximise a website's impact and performance. Taynuilt company specialising in sales, leasing and repair of photocopiers, colour copiers, printers, fax machines & computers. 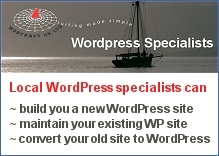 Affordable, effective websites for small business since 1996. Our websites make money for their owners. Consultancy, search engine optimisation and hosting.